Affordable housing developer Brisa Builders Corporation plans to build the nine-story project at 13-38 Central Avenue in Far Rockaway, according to an application pre-filed with the city’s building department. 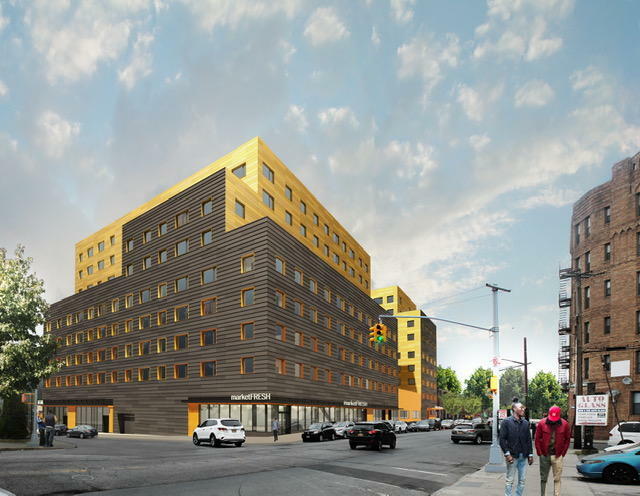 A rendering of Brisa Builders’ Far Rockaway project. The development would span just under 195,000 square feet, with about 132,000 square feet of that reserved for residential space. The Brooklyn-based developer did not immediately return a request for comment. The first floor of the new project would have classroom and gymnasium space, plus retail and storage space. The second floor will hold nonprofit offices and some residential units, and the remaining floors would house the rest of the apartments. The residential units would feature a mix of class-A and supportive housing units, according to the application. It was not immediately clear if Brisa Builders has closed on the site yet. Property records indicate that an entity recorded as “Central Ave Reality Inc.” has held the deed since 2010. The site currently holds a one-story commercial property. Far Rockaway has seen a slate of new investment and development in recent years, thanks to a zoning change and a new ferry service to Lower Manhattan that started in 2017. For example, in August, Red Group Management filed an application to construct a 17-story mixed-use project, at nearby 128 Beach 9th Street.